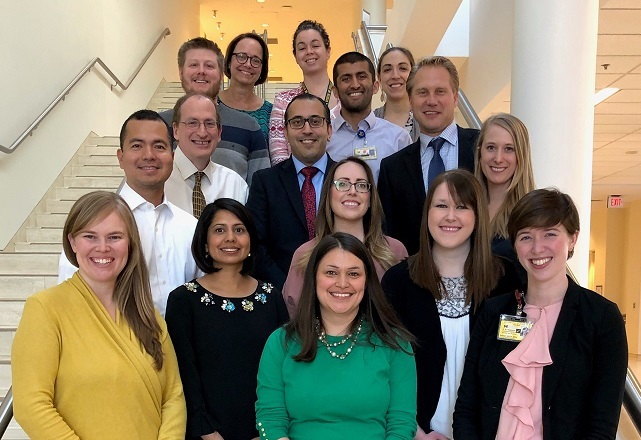 Michigan Medicine houses the Coordinating Center for HMS and is responsible for collecting and analyzing comprehensive clinical data from the participating hospitals. It uses these analyses to evaluate and understand current practice, support the implementation of improvement strategies, and to evaluate change over time. The Coordinating Center supports participants in establishing quality improvement goals and assists them in implementing best practices. Scott Flanders, MD, Professor of Internal Medicine, serves as Chief Clinical Strategy Officer for the University of Michigan Health System, Vice Chair of External Relations in the Department of Internal Medicine within Michigan Medicine, and is a hospitalist in the Division of Hospital Medicine. Dr. Flanders was a founding member of the Board of Directors of the Society of Hospital Medicine (SHM) and is a Past-President of SHM. He received his Medical Degree from the University of Chicago Pritzker School of Medicine and completed his residency and chief residency at the University of California, San Francisco. Vineet is Division Chief of the Division of Hospital Medicine in the Department of Internal Medicine. He is also Assistant Professor of Internal Medicine in the University of Michigan Medical School as well as an Attending and Staff Physician at the Ann Arbor Veterans Affairs Medical Center. He is the physician lead on the HMS Peripherally Inserted Central Catheter (PICC) Use and Midline Use Initiatives. He has particular interest in hospital-based medicine and clinical outcomes and expertise in vascular-access related complications and patient safety. Tejal Gandhi, MD is an Associate Professor of Internal Medicine in the Division of Infectious Diseases within Michigan Medicine. She is the Medical Director of the Antimicrobial Stewardship Program at Michigan Medicine and Chair of the Antimicrobial Subcommittee. Tejal is the physician lead on the HMS Antimicrobial Use Initiative. She received her Medical Degree from Northwestern University, Feinberg School of Medicine. and completed her Internal Medicine residency, HIV medicine fellowship, and Infectious Disease fellowship at the University of Michigan. She is particularly interested in measuring the impact of disease-based stewardship interventions on patient outcomes, process measures, and antibiotic utilization. Elizabeth is a Project Senior Manager in the Division of Hospital Medicine, Department of Internal Medicine within Michigan Michigan. Prior to becoming Project Manager, Elizabeth was the assistant project manager, a QA/Nurse Coordinator as well as the HMS clinical data abstractor for the University of Michigan. Prior to her position in the HMS Coordinating Center, she was a cardiac progressive care nurse for over 5 years. She received her Bachelors of Science in Nursing as well as her Masters in Nursing Business and Health Systems from the University of Michigan School of Nursing. Steve is the Chief Quality Officer for Michigan Medicine. Additionally, he is Associate Dean for Clinical Affairs and Professor of Internal Medicine at the University of Michigan Medical School and a Research Scientist in the Department of Health Management and Policy in the School of Public Health. He has particular interest in appropriateness of use of medical technology, quality of care, outcomes, and doctor-patient decision making. Valerie Vaughn, MD, MSc, is an Assistant Professor of Medicine in the University of Michigan Medical School as well as an Attending Physician at the Ann Arbor Veterans Affairs Medical Center. She is the hospitalist lead on the HMS Antimicrobial Use Initiative. She completed her Medical Degree, residency, chief residency, and Masters in Health Services Research at the University of Michigan. She is particularly interested in measuring, understanding, and improving appropriate use of antibiotic therapy in order to improve patient safety. Lindsay Petty, MD, is an Assistant Professor of Internal Medicine in the Division of Infectious Diseases within Michigan Medicine. She is a member of the Antimicrobial Stewardship Program at Michigan Medicine. Lindsay is a QI Consultant & Antimicrobial Resource Expert on the HMS Antimicrobial Use Initiative. She completed her medical degree, Internal medicine and Pediatrics Residency, and Infectious Diseases and Transplant ID Fellowship at the University of Chicago. She is particularly interested in measuring the impact of disease-based stewardship interventions on patient outcomes and provider behaviors, and assessing how improving provider education can improve appropriate use of antibiotics to improve quality of care for patients. Paul is a hospitalist in the Division of Hospital Medicine at Michigan Medicine, and Assistant Professor of Medicine at the University of Michigan Medical School. He is the Director of Consultative and Perioperative Medicine and has published several papers in the fields of venous thromboembolism prevention and perioperative medicine. Tawny is a Program Evaluation Specialist in the Division of Hospital Medicine, Department of Internal Medicine at Michigan Medicine. Tawny joined the Coordinating Center after the completion of her Masters in Health Informatics at the University of Michigan Schools of Information and Public Health. Prior to completing her graduate work, she was employed as a Registered Nurse at Michigan Medicine in the Adult Inpatient Rehabilitation department. Tawny received her Bachelors of Science in Nursing from the University of Michigan. Rachel is a Program Evaluation Specialist in the Division of Hospital Medicine, Department of Internal Medicine at Michigan. Prior to joining the HMS Coordinating Center, Rachel worked as a Patient Care Services Program Coordinator at Detroit Medical Center. Her clinical background includes acute care medicine and neurology/neurosurgical progressive care. She received her MSN with a focus in Health Systems, Populations, and Leadership and her BSN from the University of Michigan School of Nursing. Ashley is a statistician/analyst in the Division of Hospital Medicine, Department of Internal Medicine at Michigan Medicine. Prior to joining the HMS Coordinating Center, Ashley received her MPH in Epidemiology at the University of Michigan. Ashley worked as a senior clinical data manager at the University of Chicago and as a field epidemiologist within the Behavioral and Social Health Outcomes Program through the U.S. Army Public Health Command prior to her work at UM. In addition to her work with the Coordinating Center, Ashley also currently works as an analyst with the Patients Safety Enhancement Program (PSEP) and the Michigan Program for Value Enhancement (MPrOVE). David is a statistician for the AAVA at the Center for Clinical Management and Research (CCMR). Prior to joining the HMS Coordinating Center, David received his MS in Biostatistics from the University of Michigan School of Public Health. David has worked at the AAVA for the past 7 years working on a variety of VA and UM research and quality improvement projects. In addition to working with the Coordinating Center, David also currently works as an analyst with the Patient Safety Enhancement Program (PSEP). Danny is a database analyst/programmer senior in the Division of Hospital Medicine, Department of Internal Medicine at Michigan Medicine. Prior to joining the HMS Coordinating Center, Danny worked at the University of Michigan Institute for Social Research and he was a Staff Sergeant in the United States Air Force. He has a master's degree in clinical health psychology from the University of Michigan-Dearborn. Jennifer is a Research Area Specialist Senior in the Division of General Medicine, Department of Internal Medicine at Michigan Medicine. Prior to joining the HMS Coordinating Center, she conducted research designed to understand the use of information technology (IT) in healthcare, exploring a wide variety of topics, including patient safety, quality of care, security of electronic medical records and the cost of healthcare delivery. Jennifer holds a MA in Sociology from Southern Illinois University at Carbondale and Bachelor’s degrees in Magazine Journalism and Sociology from Syracuse University. In addition to her work with the Coordinating Center, Jennifer also supports the Patients Safety Enhancement Program (PSEP). Jennifer is an administrative specialist in the Division of Hospital Medicine, Department of Internal Medicine at Michigan Medicine. She has a Bachelor of Science degree in Healthcare Administration from the University of Michigan – Flint. She completed a relevant quality initiative internship at Beaumont – Rose Cancer Center in the Multidisciplinary Cancer Clinic for Head and Neck Cancer. Her role provides support for the HMS Team members and organizes collaborative wide meetings for participating hospitals.